Not only will it be used frequently, but it’ll be used for a long time, too. You need something that’s going to hold up month after month, meal after meal. When looking for the best high chair for you and your baby, comfort and ease of cleaning should be top of mind. Otherwise, you might be stuck with a chair that annoys you each and every time you use it, instead of one that makes your life easier. 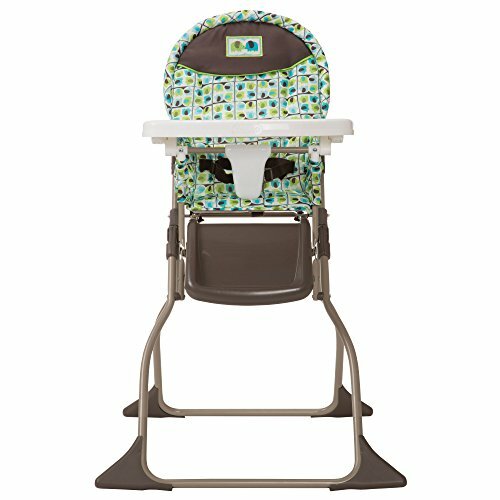 Use the links above to check the latest prices or read our in-depth high chair reviews below. You’ll see several different types when you’re searching for the right one for you. While each has their pros and cons, not every model is going to work for every family. These are the most common types you’ll see. Plastic seems to be more popular than metal, although you’ll often see a combination of the two in a single product. The great thing about these is that they usually aren’t costly. Some of them will fold so you can store them in a closet instead of setting them up on permanent display in your kitchen or dining room. The downside is that the padding that comes with them is often hard to clean and sometimes doesn’t remove from the chair at all. That’s a real problem when your child seems to make it their mission to drop more food into the abyss of their chair than they get in their mouths. You can think of this kind as the deluxe model of the typical high chair. They have more features than the standard chairs do — the trays can be removed and popped in the dishwasher, they may recline, and the seats and backs are often padded nicely. The bad news is these don’t come cheap — you’ll pay for that extra quality. The good news is that they’re built to last so you may be able to get additional use out of them if you have more than one child. Plus, many of these Cadillac models have multi purposes — they can often be transformed into a booster seat for your table when your child outgrows the high chair. Some people still value the beauty and long-lasting appeal of wood. With the bad rap plastic has earned with parents after the BPA scare, wood can be an attractive alternative for parents. The big problem with wooden models is that they weigh a lot more, which isn’t attractive for parents who don’t want to lug around heavy seats. And if they don’t come with padding, they aren’t as comfortable for babies to sit in. Besides the durability, the good thing about wooden high seats is that they aren’t as hard to clean as plastic ones that have padding in the way. Hook-on high chairs are seats that attach to a table. They’re a great option for families who live in small apartments and homes who don’t have the space to sacrifice to a full-size high chair. They’re also usually less expensive than full-size units are. Another perk is that they are highly portable so that you can bring them anywhere you’re going, whether it’s on vacation, to the babysitter’s house or out to eat. The biggest drawback is that they don’t fit every table. Also, some types can scratch tables, which is a bummer if you have a beautiful table or a family heirloom you want to protect. You need to be picky when choosing one since you and your baby will be relying on it until they’re about 2 or 3 years old. Here are a few things to think about before making your choice. This is a big deal. You’re going to be using this chair at least once every single day for two or three years. It needs to be able to withstand heavy use. I spent a little more money than I was comfortable with when picking out a high seat for my first child. But after I had my second child, I was happy I’d spent that extra money. It was still in good shape after everything my first child put it through. That meant that I could use it for my second child and skip the expense of buying another one. Sometimes trays can’t be removed — they only hislide forward a bit, so you have more room to get your baby in and out. But a removable tray can make it easier to clean up after messy dinners, and it’ll be way simpler to give the tray a good thorough washing if you can just put it in the dishwasher. Speaking of messy dinners, if you get a high chair that traps food in the crevices of the seat, you may go certifiably insane trying to get it out of there. One of the moms I know is a real neat freak, which I halfway admire and am halfway terrified of for her sake. She couldn’t stand that food kept getting trapped in the plastic padding, and that padding wasn’t removable. Rather than take the chance that her baby would find some old food in there and decide to eat it, she thought it would be safer to cut the padded seat out completely. After that, she had a super clean high chair all the time, but her baby had to sit on a towel each meal since the seat was now so hard. If you want to get more bang for your buck, consider looking for a convertible unit. If you can use it as a booster seat when your child is almost ready to join the adults at the big table, you’ll get an extra couple year’s worth of use. In addition to having padded seats, you may want to make sure the high chair you pick out has a footrest. As your baby gets bigger, it’ll be more comfortable if they can prop their feet up instead of letting them dangle. All high chairs should have a safety belt. Little kids are contortionists. They can get out of almost any seat unless they’re securely buckled in. And strapping in babies correctly with safety belts is the best way to prevent injuries (source). If you want your child to be secure, look for a 5-point harness. If you can’t find that in a chair style you love, you can go with a 3-point harness instead. The right high seat will be a much-loved workhorse in your home. Brand new baby gear is great, but moms have a special place in their hearts for those tried-and-true items that stick around for the long term. Here are our favorite models currently on the market. Maybe you're one of those parents that cringe at the thought of bringing one more garishly colored, plastic thing into your home. A big honking plastic chair in your living room or kitchen can be an eyesore. But choose a wooden high chair and you have some hope of coordinating it with your other furniture. This is a modern piece that’ll last from the infant stage all the way to adult use, and the clean lines and timeless appeal should look great in your home. It can be converted from a high chair to a toddler’s chair, but can also be used as a regular chair for any age. The conversion is easy to do and only takes about 20 seconds, and the best part is you don’t need any tools to do it. A safety belt feature is included, and can be used as either a 5-point or a 3-point harness. It also has a footrest so your child will be comfortable as they grow — and so do their legs! The stain-resistant cushion is easy to clean, and it’s waterproof so it won’t absorb spills. The tray can be placed in the dishwasher for cleaning if things get particularly filthy. If one day you want your child to join the rest of the family at the table, you can use it without the tray. So much more than just a high chair. Manufactured in the U.S. and built to last. The wood is scratch resistant. It can hold up to 250 pounds. The chair part on the head area doesn’t have any cushioning, which means if they toss their head back, they’ll hit it on the hardwood. The tray isn’t big enough to fit most plates. We love when a baby product doesn’t just have a single purpose. When something is multi-functional, you save money, time, and energy. 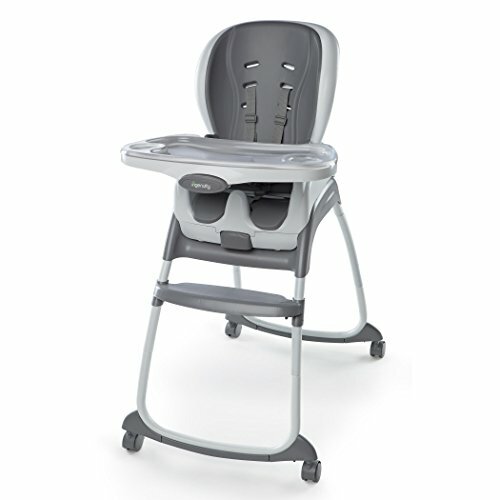 A convertible high chair is one that grows with your baby and can be used for years to come. Many high chairs have different height and recline positions. However, this one takes it a step further, providing you with six different uses as your little one gets bigger. it’s a good option for moms of multiples who want to get plenty of use out of the high chair they invest in. Start off with a traditional high chair. 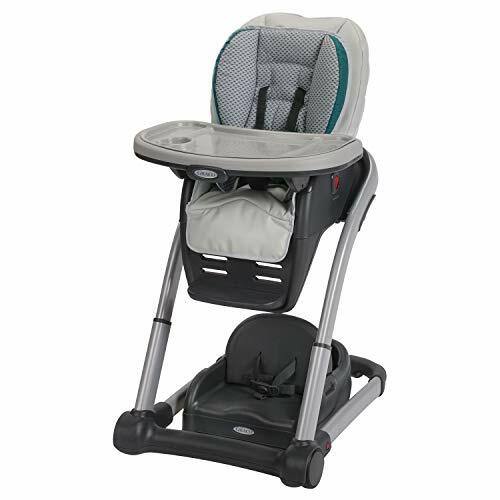 The three recline positions and six height adjustments allow you to feed your baby comfortably while also giving them a secure place to nap and play. Once your child gets a little older, the true magic of the Blossom begins. Pop out the seat portion from the wheeling base and use it as a booster seat. You can keep the tray on or remove it, depending on your child’s age. Then, use the wheeling base as a youth chair. Our favorite part? The Graco Blossom can fit two children since the wheeling base and booster seat can be combined into one or used separately. So, if you have more than one child sitting at the dinner table, definitely consider this one. The pieces are easy to take apart and assemble, allowing you to get the most out of the convertible design. Can be used by two children at the same time. Everything is machine washable or can be put in the dishwasher. It has a few more parts and pieces, so it may not be a great choice for moms without a lot of space. Toddlers need a little more room than infants do. And that even applies to their feet and legs. When you’re buying a high chair for a toddler, make sure you buy one that has a footrest, which will make your toddler much more comfortable. Toddlers come in all sizes — one may be petite, the next could be off the growth charts. So to find an all-purpose toddler high chair, you’ll need one that’s adjustable. This Joovy chair has eight different adjustable height positions, five reclining positions and two different positions for the footrest. The tray can adjust to two different positions, and it has an insert that can be cleaned in the dishwasher. Plus, it’s a large tray so you can use plates on it. Children who weigh up to 50 pounds can fit comfortably, and if you need to move the chair from room to room, it has wheels so you can easily do so. While it’s a bigger unit than some other ones on this list, you can fold it up when you’re not using it. There’s a storage compartment on the back so you can stash bibs and other necessities. The chair has locking tabs on the back to keep the shoulder straps in place. The tray can be adjusted with one hand. Food can be tricky to get out of the stitching areas on the padding. It may be a little too big for some houses or apartments. Baby-led weaning is when you allow children to feed themselves as soon as they begin eating food — you won’t be spooning food into their mouths. 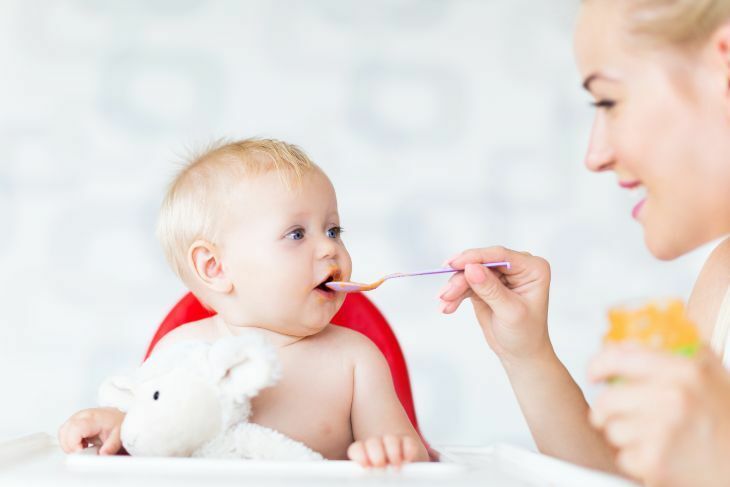 The key to not creating an enormous workload for yourself with baby-led weaning is finding a high chair that's easy to clean, because there'll be a lot of dropped food. The great thing about this 3-in-1 model is that the plastic is easy to clean, and there aren’t many crevices for food to hide in. It can also be converted to a booster seat and a toddler chair, so you’ll use it for years and get your money’s worth. The chair reclines into three different positions, and the five-point harness will keep your baby safe. It has locking wheels so you can move the chair, but your toddler can’t. The tray is dishwasher safe, and it can be removed with only one hand — and you can pop the seat pad into the dishwasher while you’re at it. Because safety straps can become filthy from food and drink spills, you may like that these are removable and go in the washing machine. The tray can be adjusted to four different positions. This chair is very easy to clean. The five-point harness and locking wheels make it an extremely safe chair. The plastic bends a bit because it’s so thin. As a mom, it’s natural to want the very best for your baby. But are you concerned about overspending? Don’t worry! Luxury baby gear is designed to be a great investment. Plus, you know you’ll be getting extra bells and whistles to benefit both you and your baby. 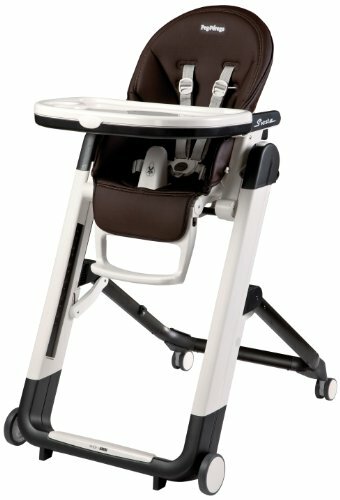 Instead of cosmetic features, choose function in your luxury high chair. You won't care how nice it looks if it’s impossible to clean or isn’t safe for you child. 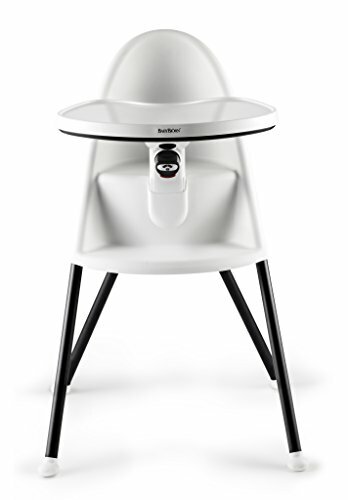 This multi-functional high chair will see you and your baby through multiple meals. Manufactured in Italy, it combines elements of both classic design and modern convenience. It also has a long list of important features to ensure mealtime is relaxed and convenient for you and your little prince or princess. The construction is especially impressive. An iron frame makes for a solid and safe base, while the special Prima Classe fabric used in the seat is buttery-soft and well-padded. The entire thing, including the upholstery, can be wiped down and cleaned with a damp cloth. While all of this screams luxury, we’re especially impressed by the many different position options. You can adjust it to nine different heights and five recline positions. This means you can use the it right away, functioning through infancy and beyond. It also features a durable wheel and brake system and a special compact folding design so you can easily store it when not in use. 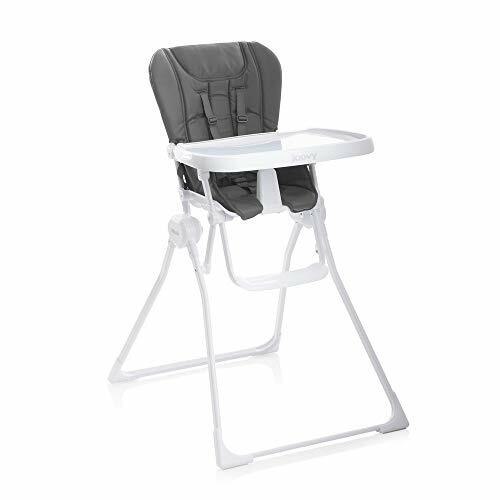 If you’re a new mom looking to invest in a durable, multi-purpose high chair, this is a great option that will last. High-quality materials will last and can be easily cleaned. Use from infancy through the toddler years thanks to the many positions and recline features. Enjoy a sleek, yet classic look. Holds up to 45 pounds, so larger children may outgrow it more quickly. Not a great option for moms on a tight budget. We understand moms don’t often have as much space as they’d like. Fitting a high chair into a small kitchen or dining area can quickly become stressful and cumbersome. 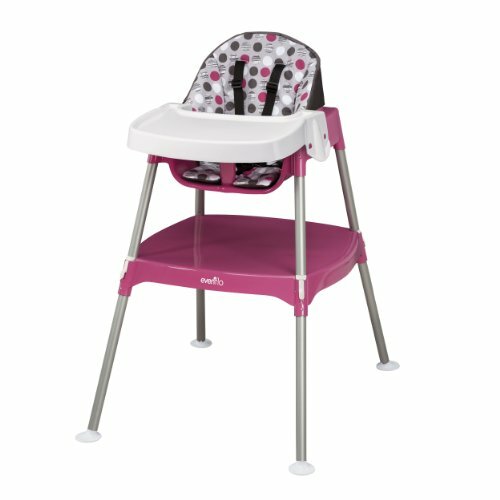 When looking for a high chair to fit in a small space, you’ll want something lightweight and easily collapsible. 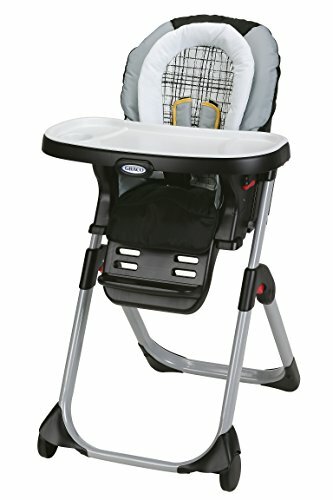 This amazing high chair is sturdy and comes with everything you want, but folds down to half its size. If you don’t have a lot of room, this is such an important consideration. Because it is collapsible, you can store it away when not in use, drastically increasing the amount of space you have between meals. You can also carry it around to other areas of your home where you might have more room for a squirmy baby wanting to eat. In total, the entire chair weighs just under 15 pounds. When collapsed, it can stand on its own and even has a one-hand carrying handle so you can move it about and store it away easily. Other features include a comfortable leatherette seat, which is available in a variety of stylish colors, a removable swing open tray with four adjustable positions, and a five-point safety harness. We also really like how all of the easy-to-clean plastic, which helps make it so lightweight, is BPA-free. Since a high chair is used most often for meals, you don’t want any of those chemicals in the plastic. All of the materials can be wiped down with a damp cloth and the food tray is dishwasher safe. Lightweight and collapsible design makes it ideal for small spaces. Leatherette seat provides an added level of comfort for your baby. The entire thing is easy to clean, saving busy moms time. The collapsible fold function may take some time to get used to and will need to be stored away from your child. There are not any height or recline adjustments. Children with Down Syndrome may not have the same muscle tone that other children will at certain ages, so they won’t typically be ready for a high chair quite as early as their peers. You may want to opt for a high chair that can recline so your child has some additional support. This one is made from a combination of plastic and metal, and it leans back so your baby will have all the support they need until they have the muscle tone to hold themselves up. Plus, this chair offers head and body support for your baby. The harness is convertible and can be 3-point or 5-point, depending on your needs. When your child is past his high chair days, you can transform this into a booster seat, so they’ll still get a few more years of use out of it. It has a dishwasher-safe insert you can pull off the chair to make for a stress-free cleaning experience. Despite being a heavy-duty chair, it folds up, so it doesn’t need to be a permanent fixture in your dining room. The tray can be removed single-handedly. You can remove the infant body support once your child outgrows it. It has wheels on the legs, but they don’t have brakes, so it slides around rather easily. The plastic padding on the chair is pretty hard and a little noisy. Unless you have a huge disposable income, you’re going to want to buy high chairs as cheaply as possible for your twins. Since they’ll probably want to eat at the same time, you’re going to need two chairs. But that can add up quickly, along with all the other baby gear you have to purchase doubles of. This model from Evenflo is so affordable; you’ll easily be able to buy two. It’s a small table and a seat you can stack to convert into a full-size high chair. As your child becomes more comfortable sitting at a table, you can take the pieces apart to let them sit lower to the ground at their little table. When stacked together, this can accommodate up to 40 pounds. When the chair and table are used separately, the chair can hold up to 50 pounds. You won’t need an engineering degree to figure out how to set this up. You can have it assembled in five minutes, and you may not even need to glance at the instructions to do it. You’ll have your choice of two colors, and will be glad to know the seat cover can be removed for washing. The safety belt has secure shoulder straps. It’s convertible to use as a toddler table and low chair. You have to tilt the tray up pretty high to remove it from the chair — that means any uneaten food on the tray may fall off. The tray is not adjustable so there’ll be a large gap between the baby and the tray where food can fall. As a mom, you’ve probably learned all of your baby stuff needs to withstand some adorable beatings. Not only does it have to survive normal wear and tear, but it must also face the explorative and unrestrained energy of your child. A long-term high chair is one designed to last through it all, using sturdy materials and a functional multi-purpose design. When you choose right, a long-term high chair will soon become a family heirloom. Featuring a classic wood design and an ingenious adjusting system, any mom looking for a long-term high chair will be impressed with this one. It’s made from cultivated beech wood, making it both a sturdy and stylish option. Each leg of the chair features slots, which are designed to hold the seat and footrest. Place the wooden plates wherever you like them until the unit perfectly fits under your table. Both the height and the depth are adjustable. We really like this because your child is unique and so is your kitchen table. 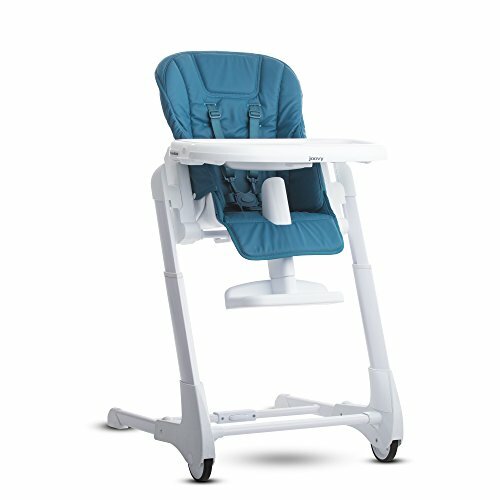 With this special system, you can ensure your little one is comfortable and safely positioned during meals. It includes a safety strap, but no food tray, though one can be purchased on the side. When your child gets old enough, you can remove the strap and even use the entire thing as a regular chair. This makes it a good option for moms of older children or who don’t plan on using a high chair during infancy. If you’re a mom looking for a durable model that will last long after your baby becomes a child, this should definitely be on your list. Cultivated beech wood is durable and long-lasting. 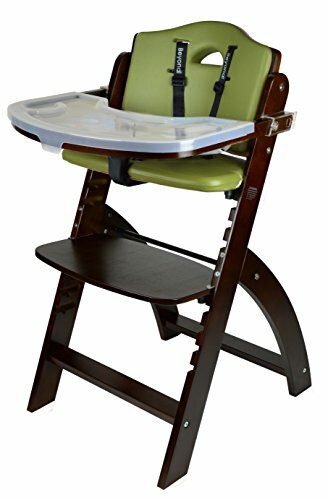 Unique wood plate system allows you to adjust both the height and depth of your child’s seated position. Can be used long after your child has grown. Doesn’t include a food tray. Has no padding for comfort. For many moms, the home is a place to express creativity and style. No mom should have to sacrifice aesthetics over function. A stylish high chair will come with all the necessary safety features along with a smart design that will look good anywhere. 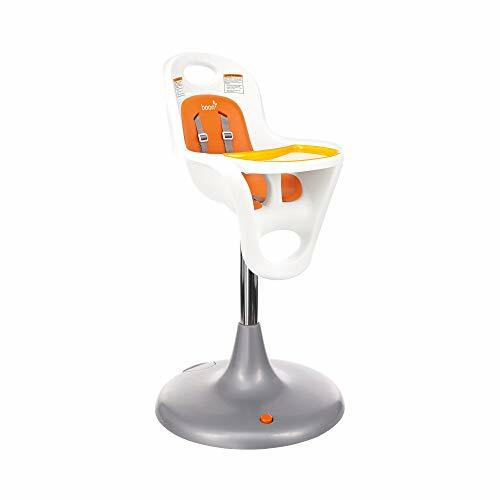 We love the simple yet modern design of this stylish high chair. The white and black color scheme will look good in almost all kitchens and we especially appreciate the minimalist take, which reduces the bulky and cartoonish look of many traditional models. However, the design isn’t just about appearances. The ergonomic design allows your little one to sit upright in a comfortable manner, promoting good posture and eating habits. Because it’s made out of smooth plastic and features rounded surfaces, food won’t get stuck, making it super easy to clean. Plastic can be scary for moms, especially when it comes to food surfaces. You don’t have to worry with this high chair. It meets the highest plastic safety standards and is completely BPA-free. The childproof 2-step locking system also ensures your baby stays safe in the high chair while they’re using it. When you’re done with it, simply fold the entire chair. Because it’s only 10 inches wide when folded, you can maintain the look of your kitchen without a large high chair taking up space. With this, you can continue to bring a sense of style and sophistication into your home while ensuring your baby’s important safety needs are taken care of. Simple and sleek design looks good in any kitchen. Keeps your child sitting upright in a comfortable way. Folds down to 10 inches wide and can be easily stored. Free of all plastic chemicals. The chair doesn’t come with any sort of padding, so it may make your child uncomfortable if used for too long. While it has a secure lock-in system, there’s no safety harness. Camping introduces babies to the great outdoors, but trunk space can be limited because you’ll already be hauling all that camping gear. So you still have some room for a tent in your vehicle, get a small, compact hook-on high chair that will clamp onto picnic tables. You can easily attach this one to any picnic table at your campsite since it fits tables up to 3.5-inches thick, and it holds a respectable 37 pounds despite being quite compact. It won’t take up much room in the trunk of your car because it folds flat. Plus it comes with a carrying bag that’s sewn right onto the bottom of the chair so that you won’t have problems misplacing it. Even though you’ll be roughing it, your baby won’t feel like they are. There’s enough padding to make this a comfortable chair for them as they enjoy nature with you. The seat has a rear pocket so you can store some wet wipes or other handy supplies. If things get a little messy, take off the seat cover and clean it in the washing machine in cold water. It only weighs 4.2 pounds. It folds flat and comes with an attached carrying bag, so storage is always taken care of. It holds onto tables well when attached correctly, making it a safe choice. There’s a small gap between the chair and the table where babies can drop a lot of food. If you want the matching tray, you have to buy it separately. Folding high chairs save a ton of space. When you look for one, you’ll want to make sure you find a lightweight option, too. You don’t want to lug a heavy thing to the nearest storage closet after every meal — why put yourself through that much work when there are better options? This option from Cosco has an easy-to-wipe seat and it can be folded flat. After it’s folded, it can stand up on its own, which means it can be set in your closet without having to be propped up against anything. When you need it again, grab it out the closet and have it set back up in seconds. The 3-point harness will work for children weighing up to 50 pounds, and the straps are adjustable so you’ll be able to find a comfortable fit for your baby. This seat is easy to assemble, which is great if you’re a little fed up with putting baby products together. There’s a cup holder on the tray, and it’ll come in handy when your baby reaches toddlerhood. 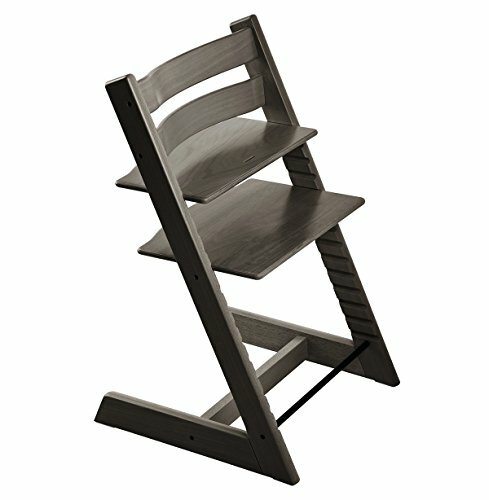 Overall this is a sturdy chair that will hold up well even with heavy use. Because the seat is lightweight and folds flat, you could put it in the trunk when traveling. It’s a smaller seat which works well for people with small apartments or houses. The fabric seat part can’t be removed, which makes fully cleaning the seat difficult. The seat leans back a little and isn’t adjustable. The Boon Flair not only has a delightful design your child will love, but a number of effective features to simplify your life. Most impressive is the pedestal base, which not only allows you to fit the high chair under any table or counter, but also has a foot-activated lift system to adjust the height automatically. When fully extended, it has a maximum height of three and a half feet. Because of the special circular base, you can swivel the entire post in any direction you need. This is great if feedings are hectic and you need to keep moving. We also love the seat because it is easy to clean, but sleek in design. A seat pad fits seamlessly onto the main seat base and can be removed with a single hand. There’s also an eating tray liner you can pop out and put right in the dishwasher. Other features include a five-point harness system, a safety post, and special urethane casters to protect your floor. Busy moms will appreciate the easy-to-use functionality will simplify feedings while ensuring clean-up is stress-free. Plus, children of all ages will love the bright colors and fun design. Modern, sleek design offers simplicity and convenience. Super easy to take apart and clean. Foot-activated height adjustment means you can use the high chair comfortably wherever you’d like. While the seat pad isn’t very soft. Your baby may get uncomfortable if sitting for a long time. The Joovy Foodoo is my personal favorite because it can fit all sizes with its eight adjustable height positions, five reclining positions and two positions for the footrest. The tray is big enough that you can use a plate on it to get your baby used to using them before they start eating at the table. This chair can hold up to 50 pounds so you’ll be able to use it for a long time. 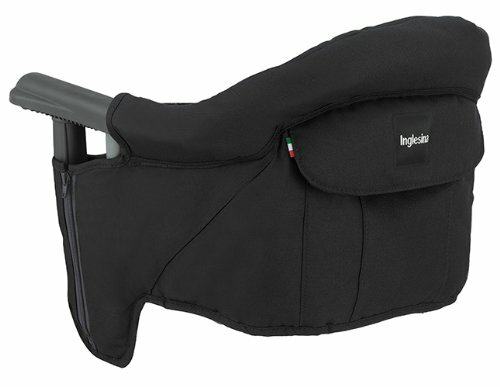 The shoulder locking tabs on the back are a nice touch that will help protect your baby. Cherish these high chair days because it won’t be long before you’re packing it away and wishing they were that little again. What about you? What’s your favorite brand? Which model are you thinking about buying? Let the other moms know in the comments below. Are High Chairs Worth The Money? Nice ideas! I am trying to ensure I have all the necessary things for my little one. I’ve been searching for the best portable high chair for my 1-year-old baby to make travel time easy and comfortable with my kids. Thanks for helping to choose the right one. Really helpful guide. Hey Michelle! Thanks so much for your kind feedback. We’re glad we could help 🙂 How many kids do you have? It’s nice to hear from mamas who try to travel with their kids! Well done!